Stamp Ornaments on green card stock using gold pigment ink. Emboss with gold, silver and copper powders (apply one powder at a time and heat). Round corners with Corner Rounder. Attach to gold decorative paper and silver card. 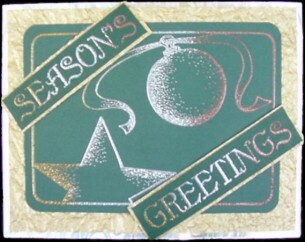 Stamp Seasons Greetings and emboss the same as ornaments. Layer to gold card stock and attach to card with foam dots or double stick tape.